The SM301/SM301-EX is a versatile, high performance PbS/PbSe array spectrometer. Its active components include a TE cooler and a 256-element PbS/PbSe detector element array. Operation of the unit for research applications is easy with the included SM32Pro - Windows based analysis software. The system is ideal for spectroscopic applications in the 1.0 to 3.0 micron (PbS) or 1.5 to 5.0 micron (PbSe) region. The SM301/SM301-EX includes thermoelectric cooling to guarantee long-term operational stability. 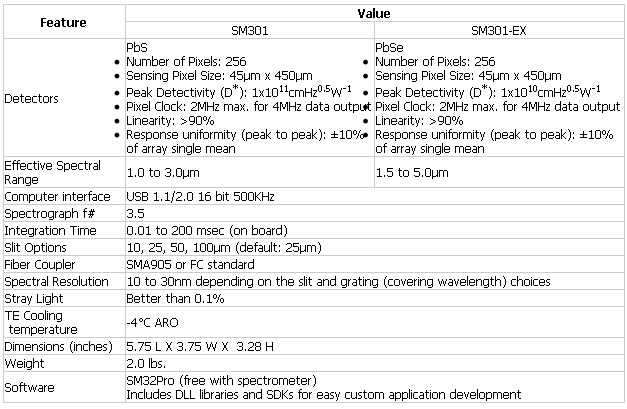 The SM301/SM301-EX employs a multiplexed PbS/PbSe array as its NIR detection element. The array is cooled and temperature stabilized at around -4oC which ensures long-term operation stability. Dark signal can thus be automatically measured by the built-in electronics periodically and subtracted automatically. Compared with conventional scanning NIR spectrometers the SM301/SM301-EX provides the multi-channel detection advantage, both in reducing the measurement time and enhancing measurement signal-to-noise ratio. The SM301/SM301-EX can operate at a readout rate of 2MHz or faster allowing fast measurement and averaging operation to be performed in a short period of time.